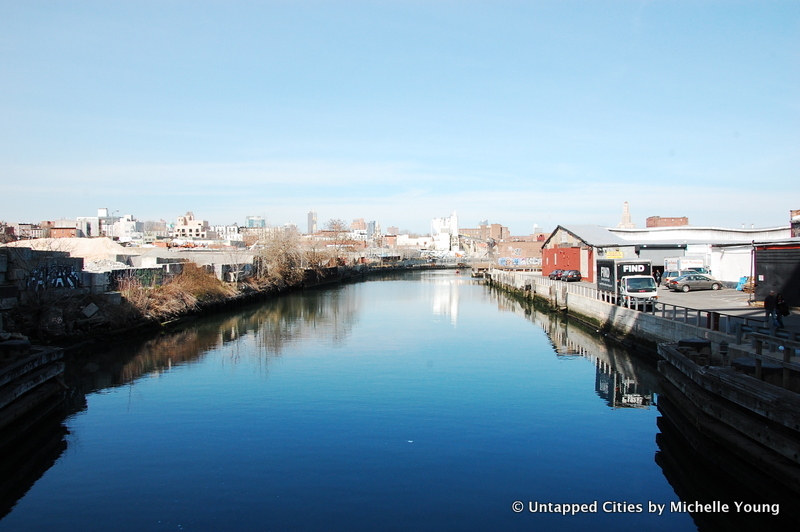 The Gowanus Canal conjures up many aspects of New York City, from a celebrated Revolutionary War history to a less glorious industrial past that renders itself visible in the superfund site the canal is today. It’s also a site of rebirth, where the emergence of off-the-beaten path art galleries and small manufacturing shops have been followed by an influx of luxury condominiums. It also plays a forgotten but important role in the Prohibition era for bootleggers and was a convenient locale for the activities of the Brooklyn mafia. Alexious sees the canal and its environs as a microcosm that tells the story of New York City, and explores in the book how the changing reception of the word Gowanus tells us a lot about the transformation that has taken place there since the earliest days of the colony and before. Our list of Gowanus Canal secrets below is derived predominantly from the very entertaining book by Alexiou. Map of Brooklyn in 1766, showing what was then the Gowanus Creek surrounded by marshland. Number 18 and 19 are the location of two important mills along the Gowanus Creek. In public domain from Wikimedia Commons. Also located in New York Public Library.